It's the final production year for Volkswagen's Eos convertible, meaning two things: this is the last year you'll be able to get your hands on the drop-top as a new model and DISCOUNTS! Eos has been marked down by more than $4,000. 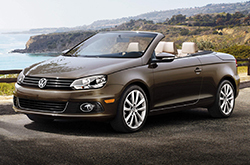 "With the features and build quality of more expensive luxury convertibles, the VW Eos is a smart choice for drop-top sun seekers." While soft-tops have become trendy, if you're a fan of hard-top convertibles, the Eos is a solid choice and Edmunds' editors call its particular power sunroof-integrated top smartly designed. It retracts in only 25 seconds and the publication notes that when the top is fully open "there's a wonderful lack of wind buffeting inside the Eos, even at highway speeds," which ensures that you can hold conversations and hear the audio system with no problem. "It's a very well-rounded convertible that delivers performance, practicality, comfort, and relative affordability in a way that other convertibles simply don't." For the 2016 model year, the VW Eos in Orlando comes in one trim level, Komfort, which is well-appointed with standard features like a leather-covered steering wheel, high-quality vinyl upholstery, dual-zone automatic climate control, Bluetooth Hands-Free Phone and Audio Streaming, navigation, iPod connectivity, satellite radio, Car-Net and other outstanding amenities. 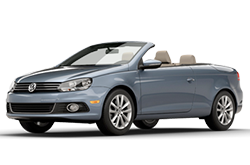 Test drive a 2016 Volkswagen Eos in Orlando and you can try out all of its features and get a feel for its fun-to-drive performance. Under the hood, there's a 2.0-liter turbocharged four-cylinder engine that produces 200 horsepower and 207 pound-feet of torque. The four-cylinder is attached to a six-speed DSG dual-clutch gearbox, which enables automatic gear changing while allowing for manual shifting when you want it. Visit David Maus VW South for a test spin and see the 2016 Eos before it's gone. Contact us to schedule an appointment with one of our sales associates. In quite a few areas, the 2016 Infiniti Q60, Chrysler 200 and the Acura ILX are outmatched by the 2016 Volkswagen Eos. If the Eos's convenient onboard technologies and attractive styling don't prove to you that it's the perfect vehicle for you, we're sure its budget-friendly price will. It's a fantastic value. Just compare its price to the opposition and you'll certainly see why so many Orlando drivers love it. Look over our facts list to learn more about the Eos - bullets below. 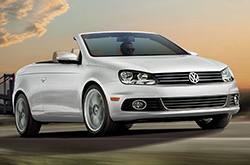 The 2016 Volkswagen Eos review above was penned by David Maus Volkswagen South's expert writers; for information about former models please view the links in the sidebar. Don't stress out over your next purchase; look to the respected Volkswagen dealership in Orlando for thoroughly researched reviews authored by industry specialists. 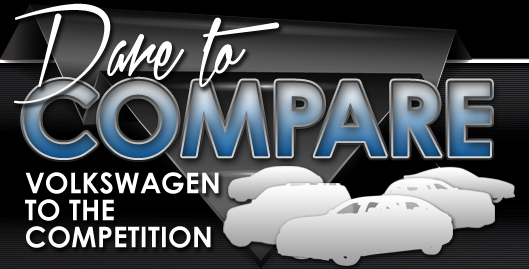 Everything you need to know about the Eos and other Volkswagen models is right on our site. Each overview is brimming with vehicle specs and practical information pulled directly from Volkswagen and other sources you can depend on to give you accurate info. Now that you've read David Maus Volkswagen South's review of the 2016 Eos, please use the contact form to message us to find out about regional OEM deals and exclusive dealership offers, so you can save big on your next purchase!